Find hotel near Old Aguadilla Lighthouse ..
For photography buffs and for people who want to explore some off-the-beaten-path attractions, the Old Aguadilla Lighthouse ruin is the place to be. Locally known as Las Ruinas, there is not much left of the lighthouse- just parts of 2 walls. However, the setting provides for some stunning photographs. Trivia: Borinquen Point Lighthouse is the officially name of the structure. It was built in 1889 and used to have a tower with a guiding light and a living area for the lighthouse keeper. It was very elaborate in architectural details. However, in the year 1918, there was a major earthquake which severely damaged the lighthouse beyond repair. The lighthouse is a 10 minutes’ walk from the golf club. Visit by Passenger van, rent a car or hire a taxi. 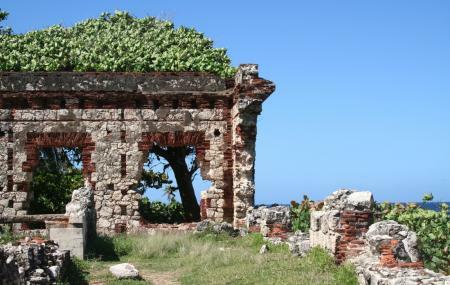 How popular is Old Aguadilla Lighthouse Ruins? People normally club together Crash Boat Beach and Punta Borinquen Lighthouse while planning their visit to Old Aguadilla Lighthouse Ruins. People also prefer to start their day with Old Aguadilla Lighthouse Ruins.